Quimby, assistant professor of clinical science, examines Squeakers in the cat ward of the Veterinary Teaching Hospital. Shelley Holland and her cat, Baxter, meet with Quimby after Baxter has recovered from pancreatitis. Jessica Quimby's work at Colorado State University requires great patience. Not just because she studies the notoriously finicky feline, but because she has spent the past decade building a body of research into a little-examined area of veterinary medicine — analyzing therapies for sick cats. "There's not a lot of time and energy put into thinking about therapies specifically for cats. We have information about how to use medications in humans and in dogs, but there's almost never information on felines," Quimby said. "So typically when we start with a drug, we have to start at the very beginning, and learn how to use it in healthy cats before we can understand how to use it in sick cats." In a sign of the importance of her work, Quimby was honored with CSU's 2017 Zoetis Research Excellence Award. She delivered a keynote talk about her work in feline clinical pharmacology to kick off 2017 Research Day for the College of Veterinary Medicine and Biomedical Sciences. The event, that was held in the Lory Student Center, was a showcase for student researchers in the college. About 150 young scientists competed in poster sessions and oral presentations. "Dr. Quimby has a very strong publication and research portfolio in clinical and translational veterinary medicine. 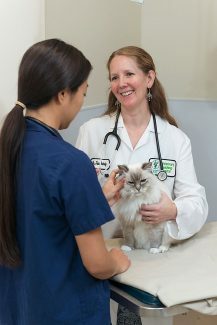 She exemplifies the 'veterinary clinician scientist' who provides excellent clinical care, instruction for the next generation of veterinary students, and applied clinical veterinary research that significantly impacts companion animal medical care," said Sue VandeWoude, associate dean for research in the college. As leader of the chronic kidney disease program within CSU's Center for Companion Animal Studies, Quimby investigates the pathology of aging kidneys and whether mesenchymal stem cells and appetite stimulants can help cats with kidney disease feel better and live longer. She is also researching the role of telomeres and senescence in the pathogenesis of chronic kidney disease in cats. "I came to CSU so I could have the power to do studies and learn new things. 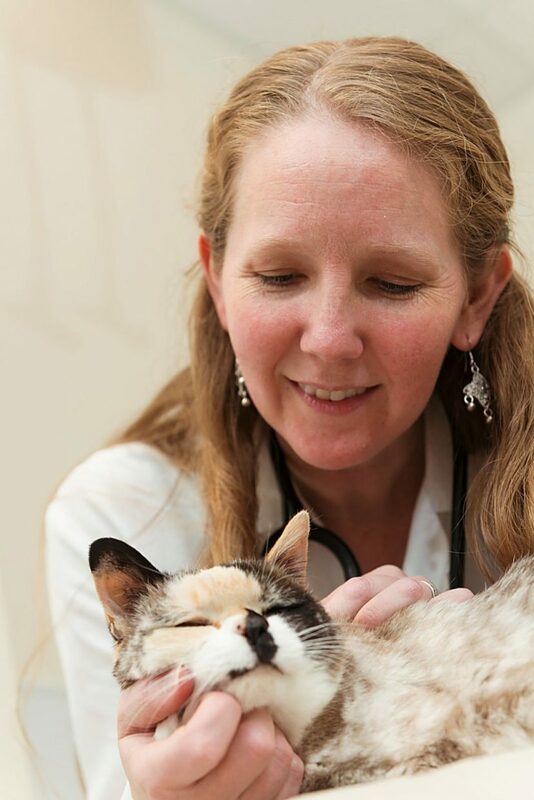 I always had the goal of working with cats, especially elderly cats, and complicated cat diseases," Quimby said. She is currently conducting a sixth clinical trial in a 10-year project to study the effectiveness of an appetite stimulant called mirtazapine. "It has taken us all this time to learn how best to use the drug in cats, and it is probably one of the most comprehensive bodies of work on how to use a medication in cats," she said. "We had to start out learning how normal cats process the oral drug, so that was study No. 1. Study No. 2 was actually proving that it increased appetite in cats. Then, we wanted to study what happened if you were an elderly cat or a cat with kidney disease." Once she understood the effects of oral mirtazapine, Quimby and her team began the transdermal trials to prove that it increased appetite in normal cats. Now, they are finally testing the gel on cats with kidney disease. "We're very excited about this clinical trial because it takes us to that next thing, which is using the transdermal gel in cats with kidney disease. It's a very long process." And it's just one medication. "You would actually have to test every single medication to know if it works in the transdermal gel or not," Quimby said. "We've done it for one drug. We did it for a second drug, ondansetron, and discovered that it doesn't work at all. It proves that even when you think the drug would be absorbed through the gel, it's not necessarily an absolute thing, so it's important to have the evidence. We try to be evidence-based when we're prescribing medications, so it helps to actually have proof that it helps the patient." Having a variety of research sustains Quimby's interest and patience over the long course of designing clinical trials, compiling data and publishing results. As assistant professor in the Department of Clinical Sciences, and faculty member in Small Animal Internal Medicine, Quimby has a chance to interact with colleagues, students and clients at the Veterinary Teaching Hospital. She is mentoring first-year internal medicine resident Kellyi Benson, a CSU veterinary alumna who recently returned to conduct research with Quimby. "She is such a great mentor. I feel really lucky that I can learn from her directly because she has so much real-world knowledge about veterinary medicine. She has taught me a lot about pharmacology, research design and presentation. I have learned from her how to be a veterinary scientist." Fellow scientist Craig Webb, head of the hospital's Small Animal Internal Medicine Service, has collaborated with Quimby on numerous projects and clinical service: "Dr. Quimby is a rare and great combination of brilliance and humor, supported by a tremendous effort toward a deep intellectual understanding of the field and her patients, yet tempered by simple common sense."